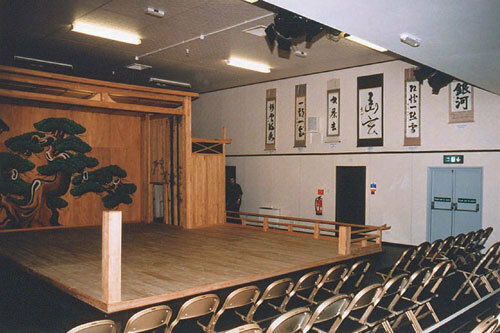 The Noh Stage, built according to traditional design, was a gift to our College in 1991 from the Japan Festival Committee and Mitsubishi Motors Corporation. It signified their appreciation of the College's strong support for an ancient samurai or warrior art which began in the 14th century and is regarded as the oldest unchanged theatre in the world. 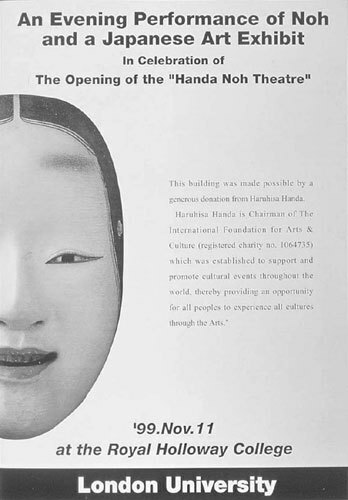 has an excellent collection of beautifully illustrated Noh books, masks, fans, costumes and audio-visual material, gifts from theJapanese Noh Centre in Hosei University, Tokyo, as well as from theGreat Britain Sasakawa and Daiwa Foundations. 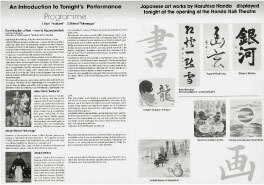 Since 1991, we have presented numerous Noh performances with the assistance ofProfessor Naohiko Umewaka - a distinguished Noh actor and the great grandson of the man who transmitted the Noh to Fenollosa, Pound and Yeats. Naohiko successfully completed his doctoral studies here and through him we have held workshops, demonstrations and performances which have all served to make this art more accessible to western students. He is one of our Visiting Professors of Drama. 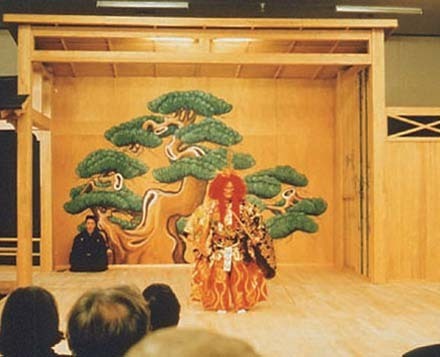 The stage has several distinguishing features: the wood is unvarnished to remind us of the art's purity and sacred origin; there is a pine tree on the back panel which is both a representation of the sacred pine tree in the Kasuga shrine at Nara and the generic God-Tree which serves as a spirit conductor. 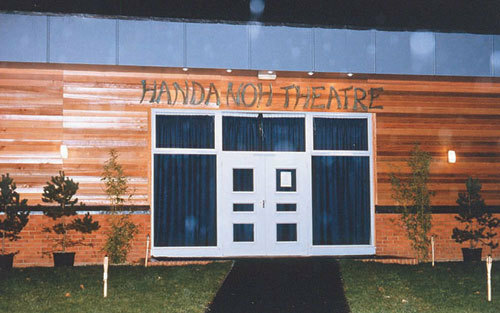 Noh drama is a mediumistic art and most Noh plays feature restless ghosts who are compelled to return to earth to re-tell their stories in a sacred space. Such a space was originally marked by a tree and four clumps of bamboo at each corner. There are bamboo clumps on the right panel of the stage which is a reminder of the sanctity of the space. Another distinguishing feature is the unusually long bridgeway which renders the stage asymmetrical. Not only is asymmetry a characteristic of Japanese art but it suggests imbalance and paradox which underpin the Noh art as well as Zen Buddhism - the religion of the samurai warriors which has shaped it. This imbalance is encapsulated in the famous Noh mask regarded as 'the soul of Noh drama' and only worn by the main actor who plays the central character and dominates the whole performance. 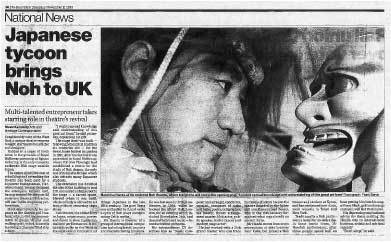 Rendered virtually blind by the mask, he describes his ordeal as comparable to 'someone walking blindfold on the edge of a cliff'. Understandably, the lay-out of the stage takes this difficulty into account by assigning fixed positions to the other participants so that the masked actor avoids collision with them. The Chorus (6-8 men) sit on the right and they comment on, or complete, his lines. 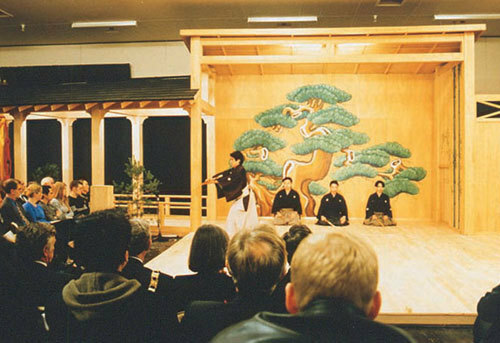 They enter the stage through the low sliding door on the right (a gesture of humility) and a relic of the samurai tradition of entering a tea-room through a similar low sliding door to partake in a tea ceremony before battle. The stage assistants and musicians are positioned at the rear of the stage, directly in from the painting of the pine tree. So everything in this theatre, from its architecture to its philosophy, content and stylisation, reflects the Zen / samurai ideal of economy and restraint. 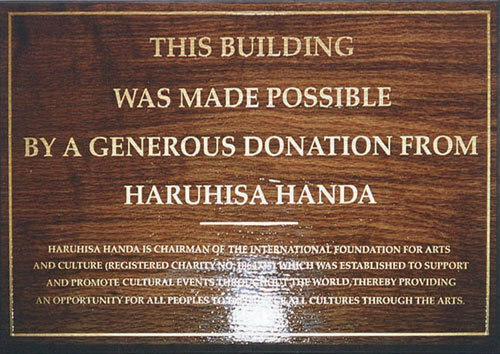 The attractive exterior of the Noh studio and the vastly extended Noh auditorium have been made possible by a generous donation from Haruhisa Handa - a Japanese patron of the Arts.